Father/daughter relationships in their different forms take the stage in a belated Thanksgiving episode of The Flash. One of the best things about this season so far as I’ve repeatedly said is the relationship between Barry and Nora. Pushing aside the time travel aspect it’s basically a tale of a father getting to know a daughter he didn’t know existed while the daughter gets to know him. There are science fiction trappings with Nora being from the future but at its core that’s what this is all about. 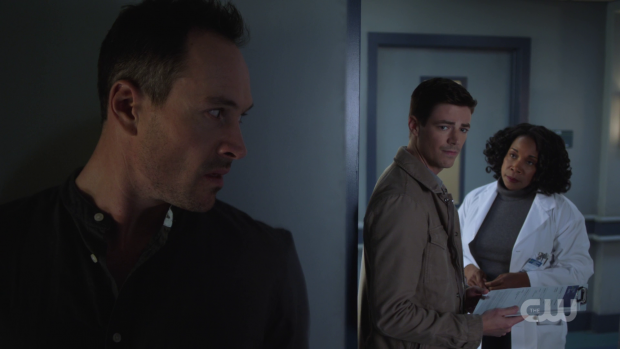 Barry has had an easier time of building s connection than Iris has but this episode explores the notion that there will be friction between them as there is in any parent/child relationship. Since this is a superhero show the problem is related to that and manifests when Nora realises that being a hero is actually really dangerous. It may seem odd that this didn’t occur to her before but it has been previously established that Nora has only recently discovered that she has powers so her experience is very limited. It’s reasonable to assume that the Metahumans she has fought up until this point have been relatively easy and outside of Cicada the threats so far this season haven’t been all that life threatening. A conversation Nora has with Iris clearly puts the idea that Barry is not the larger than life heroic figure that she sees when she looks at him. Before meeting him everything she knew about him came from the Flash Museum. The example of things not playing out according to recorded history is the singularity that opened in the season 1 finale and was resolved in the season 2 premier. Nora knows about this because of a 3D model that depicts Barry heroically leaping into the singularity to close it. This model doesn’t have the associated context such as the death of Ronnie Raymond or the terror felt by everyone involved. It’s somewhat tragic that history has forgotten Ronnie though it makes sense that there would be no accounts of how Barry felt at the time so Nora has a very limited view of that particular problem. This can be applied to pretty much all of her knowledge as she sees Barry as a heroic figure who has all the answers at every point and defeats villains with ease. We know the reality to be very different as viewers who have seen Barry struggle with various villains over the course of four seasons. 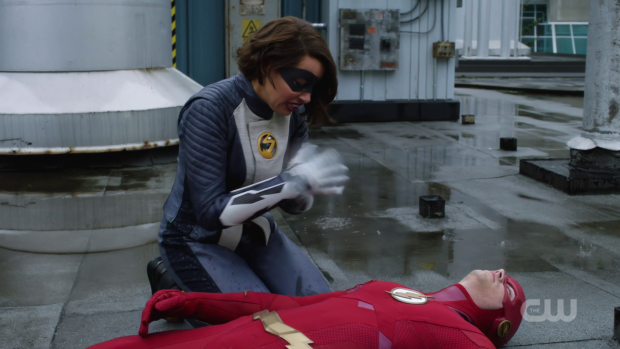 Nora’s fears come to life when Barry is briefly killed during an early action sequence and needs her to bring him back to life. This is where her father’s mortality really hits home for her and she starts to consider the cost of being a hero. 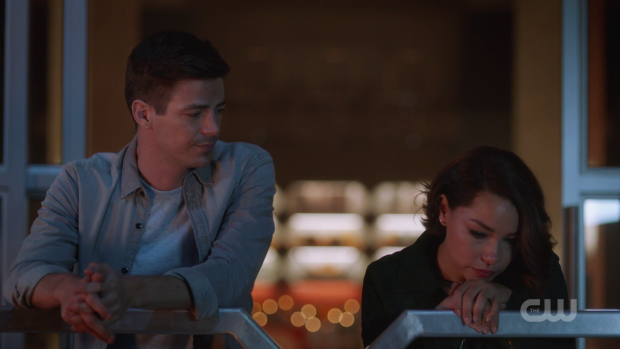 This results in a really moving scene where she talks to Barry about all he sacrifices to be the Flash and how that takes him away from his family. She asks him to quit being the Flash because there are others who can protect people but Barry can’t do that because he feels that he is needed to protect people. Nora caps that off with a simple pained “I need my father” which causes Barry to do a double take and consider the responsibilities he will one day have as a parent. Nora came back in time to stop Barry’s disappearance as well as get to know him. Prior to this episode she had it in her mind that this would be the solution to all of her problems but she now realises that Barry has had so many close calls and it was only a matter of time before his luck ran out. It seems that this finally happened during the mysterious “Crisis” that resulted in his disappearance. Even if she saves him from disappearing at that point then it’s more than likely something else will eventually happen to him. Her arc in this episode is about accepting the risks that come with being a hero. The threat doesn’t feel large enough for Barry to seem in any real danger though it’s more effective to have her worry about a fairly typical Team Flash problem than a large scale threat as it hammers home the lesson that every situation is dangerous. Barry briefly dying in the episode is supposed to set this up as a larger than average problem but the rest of the episode doesn’t really support this. Ultimately she comes to understand why Barry does what he does when a group of innocent bystanders are threatened. Barry can save them but there is a chance that doing so might result in his death. When faced with that choice Nora gives her blessing for Barry to take action showing that she now understands why taking that risk is worthwhile. Later on Barry tells her that he’s motivated to be the Flash because of his family and wouldn’t think twice about self sacrifice if it meant protecting them. It’s a hard lesson for Nora to learn but an important one and I’d like to see this expand to Nora embracing taking risks in her own heroics out of a desire to really stand for something. It’s the next logical step and the continued forward momentum shown this week is certainly appreciated. The villain of the week represents the weakest father/daughter connection. Joss Mardon (Reina Hardesty) is the daughter of Mark Mardon; the Weather Wizard. She shows up armed with Meta-tech that gives her the same powers her father has and wants him dead for some reason. This isn’t something the show goes into in any detail which makes the whole thing feel like a pointless distraction from more interesting character stories. Underwhelming villains of the week are a staple of this show but this was just lazy as there was no point throwing in the father/daughter connection other than to draw an parallel to the others being explored. Reina Hardesty does a fine job chewing the scenery and might have been better off as a villain out to do bad for the sake of being bad rather than the lazy attempt at depth. Orlin aka Cicada and his daughter, Grace (Islie Hirvonen) are the third father/daughter relationship the episode gives attention to. Flashbacks reveal the backstory being their relationship such as Grace actually being his brother’s daughter who died and left him as the only family. At first he doesn’t want this responsibility in his life and is clearly resentful of the fact that he is now the legal guardian of a child that isn’t his. Over time he warms to her and turns his life around to make a better one for her. This is weirdly abbreviated to the point that the flashbacks hit the highlights without providing much in the way of detail. There are moments of brilliance in there such as Grace acting out at school repeating curse words that Orlin uses at home in reference to his own frustrations. This moment acts as something of a wakeup call to him as he realises that his behaviour reflects on her and she doesn’t deserve to have her life ruined because of the choices he has made. I would have liked to spend more time building this relationship as it is very briefly covered. The point is certainly made but there’s obviously greater nuance to it that lies just beneath the surface. More flashbacks or longer flashbacks might have fixed this problem though for what we get there’s more than sufficient evidence that Orlin cares deeply for his niece turned daughter. His vendetta against Metahumans is less well explained other than he seems to blame all of them for the bad things that happen in the world so applies his hatred for the actions of a few to everyone with powers. The satellite crash is definitely a profound event and it’s possible that Grace’s current situation caused a psychotic break so there is still time to further explore why he is looking to kill all Metahumans. The parallel between Orlin and Grace to Barry and Nora is obvious just as DeVoe’s marriage was in theory a counterpoint to Barry’s last season. Barry’s main antagonist -at least for the moment- taking the form of a father who didn’t expect to find himself with a daughter is definitely no accident and the paternal connection will definitely be used as part of their conflict. I could see Barry trying to help Orlin somehow and Nora will obviously be placed in danger so that Barry can feel the loss that Orlin is also experiencing. This episode falters in how it uses other character. Caitlin and Killer Frost are already able to speak freely without any technological assistance which ruins the implied slow progression towards Caitlin finding a way to bring her back. Sometimes things happen far too quickly on this show with this being a clear example of that. Sherloque doesn’t feel all that thankful because of all the mistakes he has made in his life that have left him with no close friends or family. This is resolved by having him attend Thanksgiving dinner but not before depressing Caitlin and Cisco to the point that they join his pity party. It’s the comedy subplot of the episode and it just feels forced. I also felt the absence of Ralph especially in an episode about being thankful for friendship. Joe being absent because he was spending Thanksgiving with Cecille’s family was a fair enough excuse but he was also missed as part of the family get together. A solid episode that does right by two out of three of its father/daughter relationships while messing up the third and utilising other characters poorly. Nora realising that Barry isn’t the flawless heroic figure is an important lesson for her and the episode does a great job of showing that it’s a new idea that has recently popped into her head after a conversation with Iris. It leads to her petitioning Barry to give up being the Flash to support those he loves because she knows what it’s like to not have a father and feels like his sense of responsibility to others was what took him from her. Her arc concludes when she understands Barry’s need to save people and starts down her own path towards understanding the need to take risks for others. It’s a strong arc that moves Nora forward while making great use of the Barry/Nora connection. The second father/daughter pairing was much weaker. Joss Mardon was good as a scenery chewing villain of the week but her desire to kill her father felt unnecessarily tacked on just to draw a parallel. If the episode had treated her as a nuisance to be dealt with who does bad things for the sake of being bad then it would have been a lot stronger. Orlin aka Cicada and his daughter/niece Grace came across much better thanks to some illuminating flashbacks charting the course of their relationship. They get the point across, sometimes very well but could have been doing with being longer or having more of them featured. Orlin’s vendetta against Metahumans isn’t justified all that well though there’s still time to explore that. The rest of the characters are poorly used including the lack of technological assistance needed for Caitlin to talk to Killer Frost and a half baked comedy subplot where Sherloque brings everyone down with his negativity. Key characters like Ralph and Joe’s absence is keenly felt here as well.